Buried in FBI laboratory reports about the anthrax mail attacks that killed five people in 2001 is data suggesting that a chemical may have been added to try to heighten the powder’s potency, a move that some experts say exceeded the expertise of the presumed killer. A McClatchy analysis of the records also shows that other key scientific questions were left unresolved and conflicting data wasn’t sorted out when the FBI declared Ivins the killer shortly after his July 29, 2008, suicide. A senior federal law enforcement official, who was made available only on the condition of anonymity, said the FBI had ordered exhaustive tests on the possible sources of silicon in the anthrax and concluded that it wasn’t added. Instead, the lab found that it’s common for anthrax spores to incorporate environmental silicon and oxygen into their coatings as a “natural phenomenon” that doesn’t affect the spores’ behavior, the official said. Martin Hugh-Jones, a world-renowned anthrax expert who teaches veterinary medicine at Louisiana State University, called it “just bizarre” that the labs found both tin — which can be toxic to bacteria such as anthrax during lab culturing — and silicon. The FBI guarded its laboratory’s finding of 10.8 percent silicon in the Post letter for years. New York Democratic Rep. Jerrold Nadler asked FBI Director Robert Mueller how much silicon was in the Post and Leahy letters at a hearing before the House Judiciary Committee in September 2008. The Justice Department responded seven months later that silicon made up 1.4 percent of the Leahy powder (without disclosing the 1.8 percent reading) and that “a reliable quantitative measurement was not possible” for the Post letter. During the FBI’s seven-year hunt, the Department of Homeland Security commissioned a team of chemists at the Lawrence Livermore National Laboratory in California to grow anthrax-like spores under varying conditions to see how much silicon would end up naturally in the final product. Mike Wilson, a chemist for another silicone products maker, SiVance, in Gainesville, Fla., said that numerous silicon products could be used to make spores or other particles water-repellent. He also said that the ratios of silicon to tin found in the Post and Leahy samples would be “about right” if a tin-catalyzed silicone had been added to the spores. Jacobsen, a Scottish-born and -educated chemist who once experimented with silicon coatings on dust particles, said he got interested in the spore chemistry after hearing rumors in late 2001 that a U.S. military facility had made the killer potions. He called it “outrageous” that the scientific issues haven’t been addressed. As a result of Ivins’ death and the unanswered scientific issues, Congress’ investigative arm, the Government Accountability Office, is investigating the FBI’s handling of the anthrax inquiry. By way of background, I pointed out in 2008 that some of the top anthrax experts in the world say that the killer anthrax was weaponized. Anthrax would normally clump, so the fact that it “floated off the glass slide” points to the anthrax being treated with anti-clumping and anti-static agents. At a biodefence meeting on 24 February, Joseph Michael, a materials scientist at Sandia National Laboratories in Albuquerque, New Mexico, presented analyses of three letters sent to the New York Post and to the offices of Senators Tom Daschle and Patrick Leahy. Spores from two of those show a distinct chemical signature that includes silicon, oxygen, iron, and tin; the third letter had silicon, oxygen, iron and possibly also tin, says Michael. Bacteria from Ivins’ RMR-1029 flask did not contain any of those four elements. Two cultures of the same anthrax strain grown using similar processes — one from Ivins’ lab, the other from a US Army facility in Utah — showed the silicon-oxygen signature but did not contain tin or iron. Michael presented the analyses at the American Society for Microbiology’s Biodefense and Emerging Diseases Research Meeting in Baltimore, Maryland. Silicon was used in the 1960s to weaponize anthrax. Through an elaborate process, anthrax spores were coated with the substance to prevent them from clinging together so as to create a lethal aerosol. But since weaponization was banned by international treaties, research anthrax no longer contains silicon, and the flask at Fort Detrick contained none. Yet the anthrax grown from it had silicon, according to the U.S. Armed Forces Institute of Pathology. This silicon explained why, when the letters to Sens. Leahy and Daschle were opened, the anthrax vaporized into an aerosol. If so, then somehow silicon was added to the anthrax. But Ivins, no matter how weird he may have been, had neither the set of skills nor the means to attach silicon to anthrax spores. At a minimum, such a process would require highly specialized equipment that did not exist in Ivins’s lab—or, for that matter, anywhere at the Fort Detrick facility. As Richard Spertzel, a former biodefense scientist who worked with Ivins, explained in a private briefing on Jan. 7, 2009, the lab didn’t even deal with anthrax in powdered form, adding, “I don’t think there’s anyone there who would have the foggiest idea how to do it.” So while Ivins’s death provided a convenient fall guy, the silicon content still needed to be explained. The FBI’s answer was that the anthrax contained only traces of silicon, and those, it theorized, could have been accidently absorbed by the spores from the water and nutrient in which they were grown. No such nutrients were ever found in Ivins’s lab, nor, for that matter, did anyone ever see Ivins attempt to produce any unauthorized anthrax (a process which would have involved him using scores of flasks.) But since no one knew what nutrients had been used to grow the attack anthrax, it was at least possible that they had traces of silicon in them that accidently contaminated the anthrax. Natural contamination was an elegant theory that ran into problems after Congressman Jerry Nadler pressed FBI Director Robert Mueller in September 2008 to provide the House Judiciary Committee with a missing piece of data: the precise percentage of silicon contained in the anthrax used in the attacks. Nevertheless, in an attempt to back up its theory, the FBI contracted scientists at the Lawrence Livermore National Labs in California to conduct experiments in which anthrax is accidently absorbed from a media heavily laced with silicon. When the results were revealed to the National Academy Of Science in September 2009, they effectively blew the FBI’s theory out of the water. The Livermore scientists had tried 56 times to replicate the high silicon content without any success. Even though they added increasingly high amounts of silicon to the media, they never even came close to the 1.4% in the attack anthrax. Most results were an order of magnitude lower, with some as low as .001%. So, even though the public may be under the impression that the anthrax case had been closed in 2008, the FBI investigation is still open—and, unless it can refute the Livermore findings on the silicon, it is back to square one. The U.N. biologist mentioned above also said that the equipment to make such high-tech anthrax does not exist at Fort Detrick, where Ivins worked. People who work at Fort Detrick have confirmed this. In other words, a lone scientist couldn’t have done it without the support of a whole government laboratory. And Fort Detrick was not one such potential laboratory. The letter spores contained a Bacillus subtilis contaminant, and silicon to enhance dispersal. FBI has never found the Bacillus subtilis strain at USAMRIID, and it has never acknowledged finding silicon there, either. If the letters anthrax was made at USAMRIID, at least small amounts of both would be there. Does the FBI stand for the Federal Bureau of Invention? The silicon-tin connection wasn’t the only lead left open in one of the biggest investigations in FBI history, an inquiry that took the bureau to the cutting edge of laboratory science. In April, McClatchy reported that after locking in on Ivins in 2007, the bureau stopped searching for a match to a unique genetic bacterial strain scientists had found in the anthrax that was mailed to the Post and to NBC News anchor Tom Brokaw, although a senior bureau official had characterized it as the hottest clue to date. The widow of a Florida tabloid photo editor who died in the 2001 anthrax mailings is casting fresh doubt on the FBI’s conclusion that a lone federal scientist staged the attacks, according to new documents filed in her lawsuit against the government. The statements raising questions about the FBI’s conclusions were made in depositions earlier this year by W. Russell Byrne and Gerard Andrews, who oversaw Ivins’ work at the U.S. Army Medical Research Institute of Infectious Diseases at Fort Detrick, Md. Byrne was chief of bacteriology at the biodefense lab from 1998 to early 2000 and Andrews held the post from 2000 to 2003. According to court documents, Byrne told Stevens’ attorneys that Ivins “did not have the lab skills to make the fine powdered anthrax used in the letters” and that it would have been difficult for Ivins to do the work at night undetected. Byrne said others would have noticed the unusual use of equipment and supplies because of the hazardous microbes involved in their work. “They pay attention to things because your lack of observation could cost you your life,” Byrne said, according to the documents. In a telephone interview Thursday, Byrne said he knew Ivins for 15 years and remains unconvinced he was capable of such crimes. “It just wasn’t the Bruce Ivins that I knew,” said Byrne, who retired in 2003 and still lives in Frederick. Andrews also said Ivins did not have the expertise to do the work and some of the necessary equipment wasn’t available at Fort Detrick at the time. Andrews added that in the 16 years he knew Ivins, there was no indication “that he understood the weaponization technology of anthrax spores, nor did any of his colleagues ever talk to me about his interest or understanding” of the processes required. “Dr. Andrews stated in his opinion, it would take more than one person to achieve this attack because of the unusual physical characteristics of the powders,” the court document said. So what evidence does the FBI have against Ivins? As Anthrax expert Dr. Nass notes, all of the FBI’s “circumstantial” evidence falls apart the minute it is looked at closely. At the end of the day, the FBI literally hinges its case on the fact that Ivins was “odd”. Based on that criteria, the FBI could convict anyone it chose based on mere character assassination. So Who Did Do It? And I think there are people within our government — certainly from the source of it — who know where it came from. [Taps the table to let that settle in] And these people may not have had anything to do with it, but they certainly know where it came from. The FBI gave its consent in October, 2001 for the remaining samples of the Ames anthrax strain to be destroyed, thereby permanently destroying crucial “genetic clues valuable to the criminal inquiry”. Why would the FBI allow the Ames samples to be destroyed, other than to prevent fingers from being pointed toward the real killer, someone who worked for the U.S. government and had access to U.S. bioweapons? Senators Tom Daschle and Patrick Leahy were holding it up because they realized what this would lead to. The first draft of the PATRIOT Act would have suspended the writ of habeas corpus [which protects citizens from unlawful imprisonment and guarantees due process of law]. Then all of a sudden, out of nowhere, come these anthrax attacks. 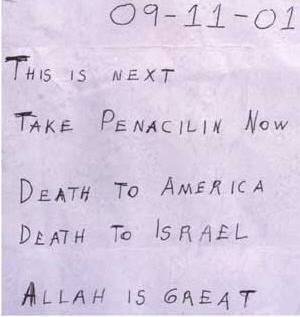 Whether or not the anthrax was actually mailed as a false flag attack, it is clear that it was used to drum up fear. The bottom line is that fear of terrorism makes people stupid, and so we should at least question whether the government is selling fear for political purposes.